VALLEJO -- Although temperatures never reached past 75 degrees, a healthy dose of humidity - 56 percent - provided for a warm day at the 2019 Fred Faucett Invitational at Vallejo High School as the championship portion of the season rapidly approaches. Some of the area's top young talents are the leading headliners from the meet. 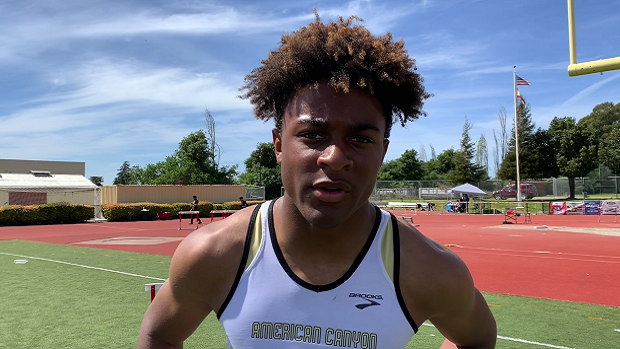 On the boys side, American Canyon freshman sprinter Croix Stewart was one of the underclassmen who stole the show, winning both the 100-meter dash (10.95) and 200m (22.18). "Just get a good start, try to start out in front of everyone and get the lead early so I wouldn't have to make up for it later in the meet," Stewart said about his plan heading into the races. "My start was pretty good in both races, that's mostly what helped me." Stewart's fine freshman season continues -- he's currently No. 3 in the North Coast Section for the 100m (10.84) and No. 4 for the 200m (22.10). In both instances, Stewart is the only underclassman on each top 10 performance list. By season's end, Stewart said he is aiming for a 10.5 or 10.6 in the 100m and in the mid-21 second range for the 200m. Joining Stewart as one of the underclassman stalwarts was Stockton St. Mary's freshman Jadyn Marshall, who took home the win in the 300m hurdles (40.21). Although Marshall won, the time is actually well off his personal record of 38.45, which he set in the beginning of April at the prestigious Arcadia Invitational. Marshall is currently No. 2 in the 300m hurdles in the NCS with his mark from Arcadia, and, like Stewart, is the only underclassman on the top 10 performance list. "I did pretty good, got out hard in Lane 5 and caught him first hurdle," Marshall said. "I had a little technical difficulties -- I went kind of wild with my left (leg) -- and I need to tighten that up a little bit for me to reach 37 by the end of the year." And that's Marshall goal: Any mark in the 37-second range. He's also gunning for a spot at the California State track meet. Marshall will have the chance to do so beginning next week. On the girls side, Vanden junior Sameerah Evans was one of the standout performers. Evans won both the 100m hurdles (15.40) and the triple jump (36-06.00). "I felt like it went so-so," Evans said. "Right now, I'm just competing against myself and the time. I need to get in a different mindset, need to not worry about other competition. That's what I need to work on." Some could say Evans is being modest -- she is one of the top dual-threats from the Sac-Joaquin Section. Right now, Evans is No. 5 in the SJS in the 100m hurdles (14.77) and No. 1 in the triple jump (38-10). It's that last event, the triple jump, that Evans considers her bread and butter. And she's ready to feast. "I actually want to get on the podium (at state)," Evans said before correcting herself. "I will be on the podium for triple jump. That's my goal." Evans will begin her march to the state podium at the Sacramento Meet of Champions on April 20 at American River College.